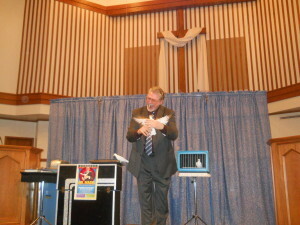 Following one of Dr. Flegal’s shows at a church event, the pastor took the opportunity to share with his congregation. He said, “Isn’t it good to hear laughter in the Lord’s House?” And that is where the name of this program came from. It is mentioned in Proverbs (17:22) that, “A merry heart doeth good like a medicine: but a broken spirit drieth the bones.” What better place to share merriment and good clean fun than in the House of He who created laughter! Laughter In The Lord’s House does not preach. It simply offers a special time of Family-Oriented Fellowship laced with fun, surprises, and lots of laughter while giving thanks to The Creator who allows us to experience such things. Isn’t it time for you and your congregation to get merry? ► “Gary Flegal’s “Laughter In The Lord’s House” was well received and enjoyed by all. This Ministry of Joy was instrumental in making our Fall Season opening presentation a great success. The focus on your many talents was evident and you did indeed provide us with a memorable performance. Thank you again and we look forward to working with you again at Calvary. ► “First United Methodist Church, Hendersonville, Tennessee, highly recommends the varied talents of Gary Flegal. His wonderful program, “Laughter In The Lord’s House,” delighted our congregation. 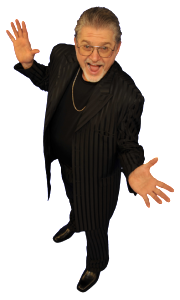 We recommend Gary’s entertainment to anyone without reservation. ► “I wish to express my appreciation for the excellent program you presented at our church. This is the second time I have had the privilege of being in your audience. Both times you were extremely entertaining as well as presenting a good message about the joy of life.